The Nigerian President has asked the National Emergency Management Agency (NEMA) to declare “national disaster" in the event that anticipated flooding turns a reality in parts of Nigeria. You may have heard that some Nigerian communities were at risk of being washed away by flood except something drastic was done. While some states are already experiencing flood, others are taking precautions and now there is a 'national disaster' declaration that may be coming. President Muhammadu Buhari on Friday delegated authority to the Director-General of the National Emergency Management Agency (NEMA), Mustapha Maihaja, to declare a “national disaster" in the event that anticipated flooding turns a reality in parts of Nigeria. 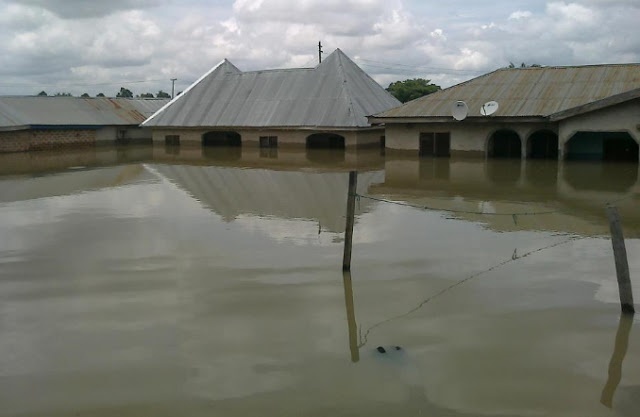 A spokesman for President Buhari, Mr Garba Shehu, said the President’s directive followed a warning by the Nigeria Hydrological Services Agency that Rivers Benue and Niger had almost reached levels that resulted in flooding in 2012. The 2012 disaster led to loss of lives and property in some Nigerian states. A letter to the Director-General of NEMA, entitled: “Situation Report on the River Flood along the Banks of Rivers Benue and Niger’’, which was signed by the Chief of Staff to the President, Abba Kyari, said the agency was also asked to acquire relief materials of at least 3 billion Naira. The letter read: "Delegation of authority to the Director General of NEMA to activate the Disaster Response Units of the military for possible search and rescue missions, and the procurement and proportionate stocking of relief materials and health related items up to 3 billion Naira to provide for the needs of possible victims". The letter also instructed the head of the emergency agency to provide regular updates to the President on the situation. THIS IS HOW TO KNOW FLOOD DAMAGED VEHICLE FROM U.S.